Climbing, a photo by PhylB on Flickr. 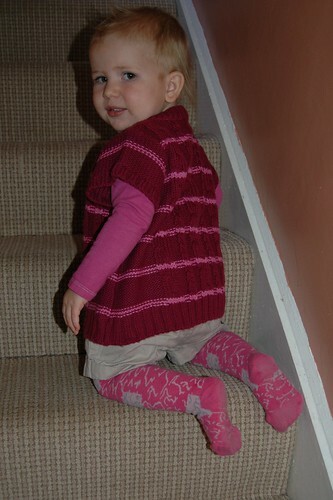 Here is a photo of Amaia climbing the stairs in my hall. We have two halls downstairs - an internal one painted pink and the one leading from the front door upstairs which is painted light and dark terracotta. Last night I asked Anna where she had left her nursery bag. 'In the skinny hall', she replied. The pink hall, being internal, with five doors off it, is substantially smaller, so I assumed that is what she meant, but her bag was nowhere to be found. I went out to the big hall and there it was. Odd... until I questioned her further. You see according to Anna, apparently 'skinny' doesn't mean 'narrow', it means 'the colour of skin'! So my pale terracotta hall is in fact my 'skinny' hall! Sweet!